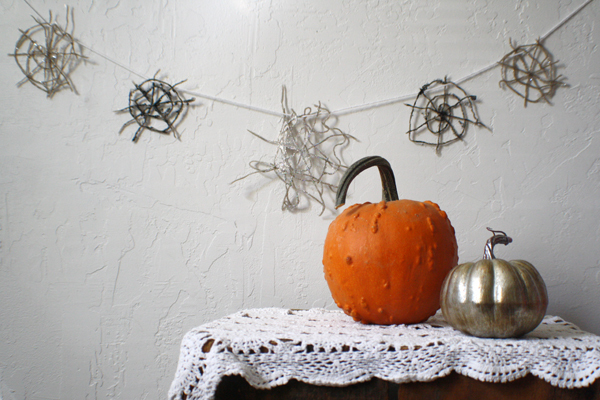 There are three days left until Halloween, just enough time to create this nifty spideriffic garland. All you need is yarn, glue and glitter. This is a project you will need to work on with your kiddos. Your kiddos can practice their cutting skills by cutting the lengths of yarn, they can also pour the mod-podge or glue and dump yarn into the mess for saturation. They may also a go a tad bit wild with the glitter, have fun! Grab your wax paper and lay out a sheet on a surface where it can camp out for a day or so. Use a ball point pen or pencil to trace or draw a circle about six inches wide. 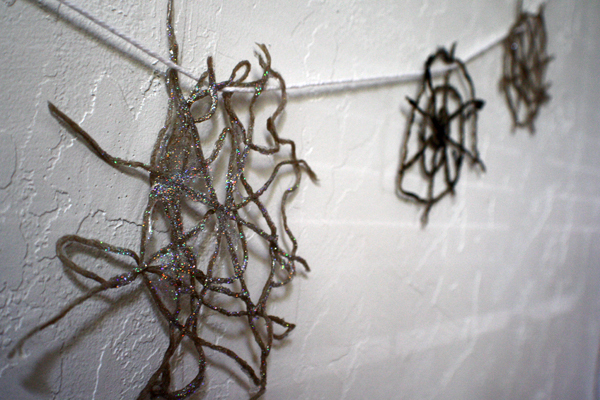 Draw at least five for your garland so it won't take forever for your webs to dry. Pour your mod-podge into a shallow bowl. If using glue, mix your glue with a little water to thin it out. Cut a series of short lengths of yarn. You will need five for each web, four about the same length and one a couple of inches longer. My strands were 3" and 6". Dump all your yarn strands into the sticky mess. To create a web pick out one of the sticky soaked yarn strands and pull of excess mod-podge using your fingers. Lay the first strand across a circle, add your second strand across the first and repeat with the next two strands to create a sort of asterix/star shape. 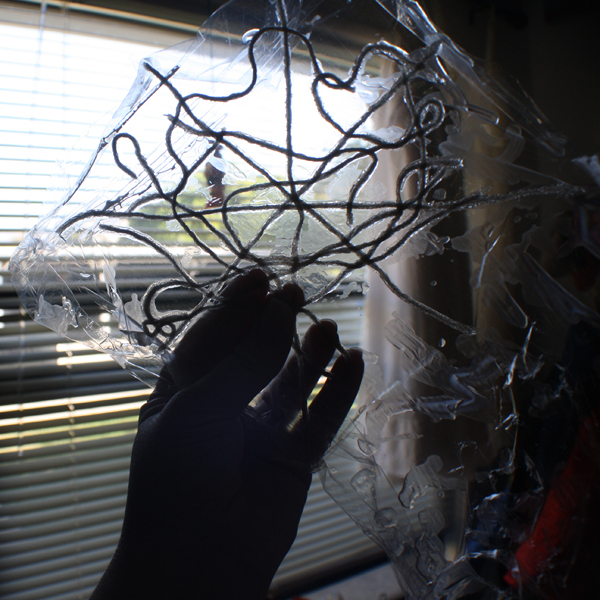 Alternately, you can try to craft a web as you see fit or your kiddo can mound a stringy mess to their delight. Set aside to dry for at least four hours. Drying time and sturdiness of your webs depends on the goopiness of your yarn when you begin. Once dry, use a paintbrush to paint on a bit of glue to the surface of your webs. 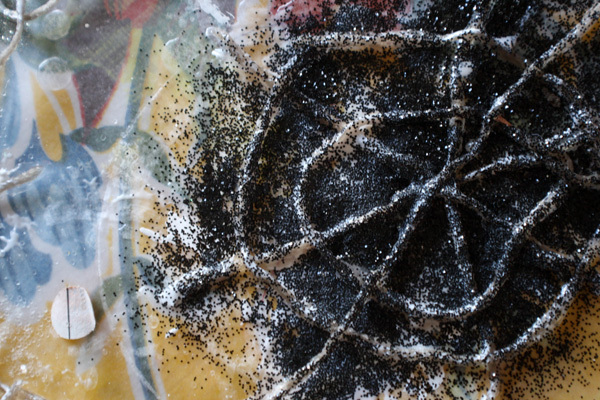 Sprinkle a bit of glitter on top and set aside to dry for one hour. 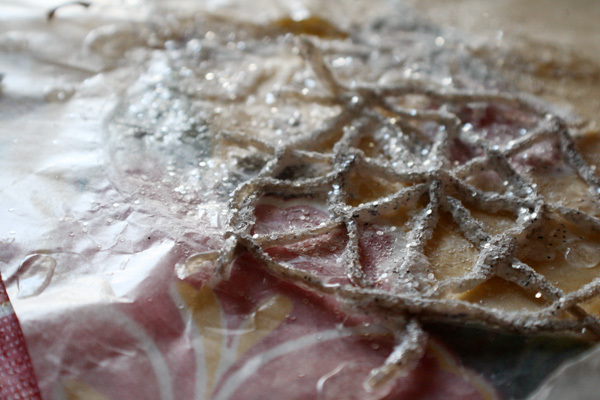 Once dry, gently peel back the wax paper to reveal your web. If you have extra blobs of dried glue in between the strands of your web, use a pair of scissors to trim. 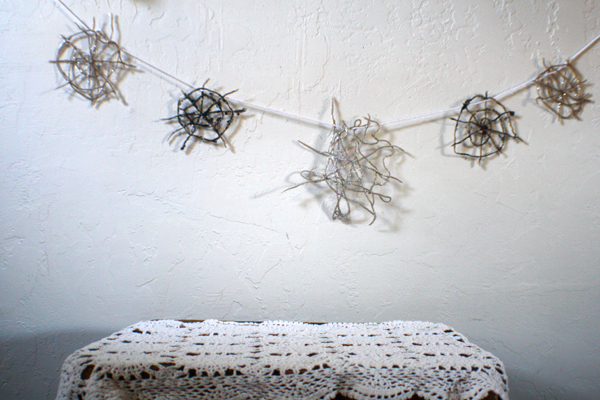 To create your garland, cut a length of yarn at least three feet long and thread your webs onto it. You can tie loops at each end for hanging or use a couple of pieces of happy tape to affix to your wall. *Yikes! I thought I took photos of each step but I did not. I hope you enjoy this project any way, thank you! What a neat project! Your blog is lovely. Following you now via Bloglovin. I love that you added glitter to these! I'll be sharing soon on The Crafty Crow! Looks like fun! Reminds me of when I made ornaments with string and glue over a balloon. Show Me a Story; winner announced!